The last post provided the introduction about what “policy” in the context of WCF is about. Now we are going to go ahead and actually build our own policy. For this endeavor we keep the actual functionality simple: During a service call, client and server are to add timestamps whenever a message goes out or comes in. Those timestamps shall be maintained in a list that is forwarded with each message, doing so as SOAP header, since this is not part of the regular contracts. This will create a trace of the whole request/response chain. (“Chain” may sound a little presumptuous, but if one service calls others, this might become more of a challenge.) We’ll call this (a little snobbish) “tracking policy”. For details on behaviors (including extension elements to be used in configuration rather than code) see here. Now for the first interesting part: How do we insert a policy assertion for our policy into the WSDL? WCF supports writing policy assertions via IPolicyExportExtension, however only for binding elements, not for behaviors. Of course we could provide a respective binding element and ask the developer to configure it – on top of the behavior that he already put on his service. Not exactly comfortable and a source of errors. 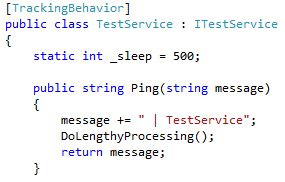 Now, IServiceBehavior.Validate is obviously not intended for this kind of manipulations, but what the heck, it works, and it makes things easier for the application developer. In our case we only needed the existence of the XML element to publish the policy. More complex policies may need to publish additional information. In this case all you need to do is to include XML attributes and/or elements as you like as children of the root element of the policy assertion. WS-Security Policy goes even further and provides several different policy assertions. That concludes the server perspective for our policy assertion. The next post will look at it from the client perspective.